Be the first to share your favorite memory, photo or story of Virginia "Jenny". This memorial page is dedicated for family, friends and future generations to celebrate the life of their loved one. 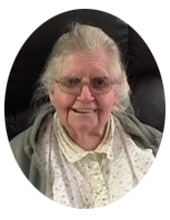 Virginia “Jenny” Clarice Eldridge Henson, age 79, of Heritage Place, Morehead, passed away Sunday, December 2, 2018, at St. Claire Health Care in Morehead. Born August 7, 1939, at Sharkey in Rowan County, she was the daughter of the late Henry and Maggie Mae Markwell Eldridge. In addition to her parents, she was preceded in death by seven brothers, Ray, Russell, Virgil, Fred, Henry, Jr. and infants Willie and Vernon Eldridge; five sisters, Glady Michaels, Ruth Purvis, Opal Eldridge, and infants Sarah Jane and Maggie Eldridge. Her husband, Charles Henry Henson, also preceded her in death on October 10, 1998. Jenny is survived by one brother, Donald Eldridge of Ringos Mills, and several nieces and nephews. She was a homemaker and member of the New Hope United Baptist Church. Funeral service will be conducted 11 a.m. Thursday, December 6, 2018, at Northcutt & Son Home for Funerals Memorial Chapel with Elder Theodore Evans, Elder Lawrence Adkins, and Elder Isaiah Vance. Burial will follow in Eldridge Cemetery. Visitation will be from 5 p.m. to 9 p.m. Wednesday, December 5, 2018, at Northcutt & Son Home for Funerals with a church service beginning at 7 p.m.
To send flowers or a remembrance gift to the family of Virginia "Jenny" Eldridge Henson, please visit our Tribute Store. "Email Address" would like to share the life celebration of Virginia "Jenny" Eldridge Henson. Click on the "link" to go to share a favorite memory or leave a condolence message for the family.